There will be a public meeting organized by the Chagrin Valley Connectors TLCI Study. The purpose of this study is to look at potential connections for cyclists, hikers, runners, and others between the North and South Chagrin Reservations along Chagrin River Road. The study itself is being conducted by the Village of Gates Mills, Cleveland Metroparks, NOACA, and Environmental Design Group. In this second Chagrin Valley Connectors Public Meeting, they will be discussing the results of the first Public Meeting, Online Survey (they had 300 responses!) and reviewing the revised Draft Alignments for the on-road bike lanes, off-road hard surface trails and natural surface trails. 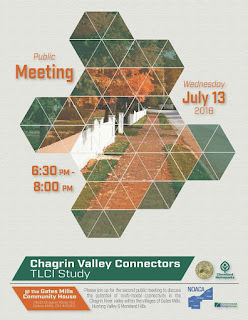 For updates, see the Chagrin Valley Connectors TLCI Study on Facebook.